This cute 3 piece towel set is for the perfect little girl in your life that loves to dance and/or does ballet. The set includes a bath towel (approx. 27x52), a hand towel (approx. 24x15) and a washcloth. 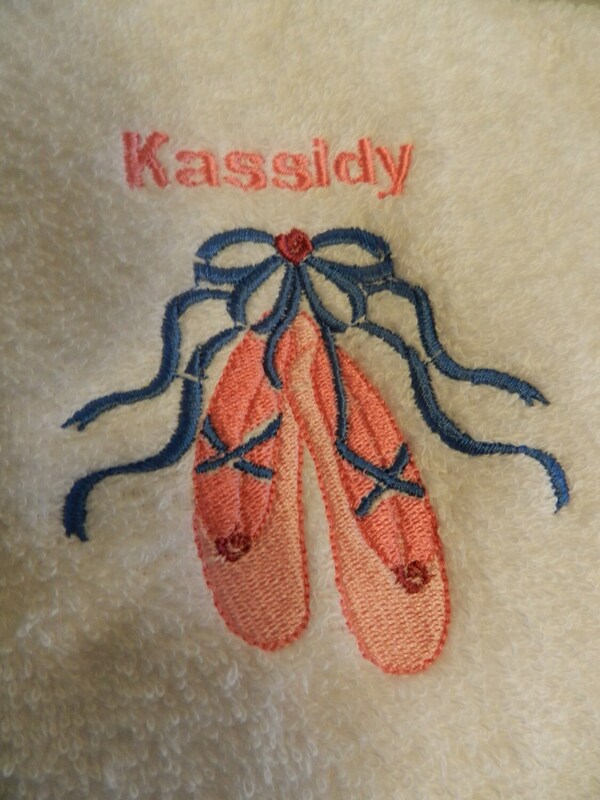 These ballet slippers are embroidered on white towels that are 100% new cotton towels. This makes an excellent gift for the little ballet dancer in your life or for the person who loves ballet... of any age!! If you want more then 1 set, let me know and I can set up a special listing just for you. This can also be made into a Tee-Shirt in youth sizes, for $23.00. If you are interested in the shirt, I will make up a special listing for you...let me know! Please note that I do not stitch out the towels ahead of time because I offer personalization. Please allow up to a week for me to stitch the set out and get it shipped to you. Thread colors are subject to change...but will most likely be the same or so similar that you wouldn't notice the difference. Please take note of these shipping directions: If your zip code starts with a 7, 8, or 9, you need to add $3 to the shipping charges! You can go to a separate listing that I have for $3 and add it to your cart. 1. Name of personalization and if you want it in all caps or just the first letter in caps and the rest lower case. Unfortunately, the colors ran together after just one washing in cold water!